And in this post, we will look at the 5 factors that are common among a lot of these successful content creators. It is not enough to just have listeners of your podcast. It is critical that you have a community of listeners. Let us take Bill Burr’s Monday Morning Podcast, for example, the people who listen to the podcast not only listen to his podcast for the riffing that Bill churns out twice every week but also for the fact that Bill actively brings his listeners to the forefront in his podcast. Bill Burr chooses to do that with programs like Underrated and Overrated, Fan Questions and Fan Lists, this makes people who listen to his podcast feel like they are part of a community. And that is gold when it comes to content marketing. If you are a podcaster and you post your podcast on iTunes, that’s great. However, you are banking on listeners discovering you on the iTunes search platform. You are missing on massive traffic that you could get from platforms like Sticher and Podcast Republic. There are more android phones in the world than iPhones, so it is important that you cater to that market as well. And what do you have to lose? You are creating the content anyways. All you need to do is post it. It is very important that you use all the social media channels that are relevant to your podcast. Let’s assume that you run a podcast on cooking, choosing to promote your content only on Facebook would be a bad idea. Your core audience is on Pinterest, you should be there too. If you are not on Pinterest it is as bad as leaving that advertiser revenue on the table. So it is important that you first identify the places that your potential audiences hang out in. And then make sure that you reach out to them in those platforms. Both organic and paid marketing is good and if you are able to attract and retain an audience of decent size then you get good ROI on your effort and money. A good example of this behavior is NPR. They are everywhere. Almost to the point of overdoing it. But it is getting their job done. 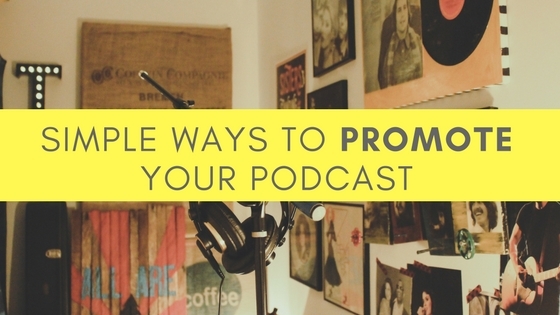 This is one of the most underutilized hacks when it comes to promoting your podcast. And those who have managed to take advantage of this technique have reaped handsome rewards for it. It is not enough to go on every podcast that will have you. It could be done but it is not the optimal way to go about it. But rather, look at podcast where you feel your audience are present. If you are a comedian then going to another comedian’s podcast or an entertainment podcast is a lot more productive than going to a finance news podcast. Take your time and find out podcasts that can complement your content or has similar content. Your audience already hang out there, you just have to make yourself discoverable. This might seem counterintuitive but it works like a charm. Look for offline events that are relevant to your podcast and go there. Also, make sure that you tell your existing podcast audience that you are going and that they can meet you there. You find a new audience for your podcast in the event. You give your audience an opportunity to see you and know a bit about you in person. Also, give regular updates on events of fellow podcasters and ask them to return the favor. This kind of cross-promotion can help you reach a larger audience at practically no cost. Monday Morning Podcast by Bill Burr is a good example of this. Bill sometimes talks about his standup gigs and also some other comedian’s gig as well. This sells more tickets at his offline events (Not that he needs to try hard to sell) but also gives his audience an opportunity to meet with him. These are the most common factors between some of the best podcasts on iTunes. Bonus Tip: To make your podcast searchable, make sure you transcribe it. You can order your podcast transcription from Scribie at just $0.75/minute. Have any more ideas on how to promote your podcast organically without spending a dime? And don’t forget to share this blog piece if you found it useful.